As far as phones go, cordless ones have had an eventful year at our house. We had an old Uniden forever. Until someone left it on the bumper of the car while out front with the kids. Then drove away. Kids in the car. Phone on the bumper. Dearly departed old phone must have been resurrected to phone heaven. We couldn’t find it anywhere retracing our route. So a neighbor loaned us her unused phone. A new battery gave it new life. But only temporarily. The loaner phone died last week. We’ve yet to bury it. 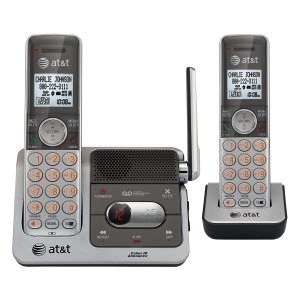 But we have replaced it with the fancy new unit you see pictured herein: An AT&T CL82201 DECT Cordless Phone in stylish silver & black. No more older than we remember or plain white loaners for us, folks. Our new phone has more features than we’ll ever use. And we've got two—count them two—handsets. Exciting indeed. Where we previously had only one handset, now we have the base station with answering machine upstairs and the second handset on the charging station downstairs. I can pray anytime. I can talk to God even more easily than talking with my kids on this fancy new phone. No equipment required. Just a heart that connects. Whatever the need. Whatever the question. Whatever the request. Whatever the complaint. Whatever. God is always there. No phone required. Because of the Lord’s faithful love we do not perish, for His mercies never end. I say: The Lord is my portion, therefore I will put my hope in Him. Share your prayer needs or story of answered prayer in the comments below. Or share this post with someone who needs it. You are welcome to subscribe as well.